"My garden is my favorite teacher." 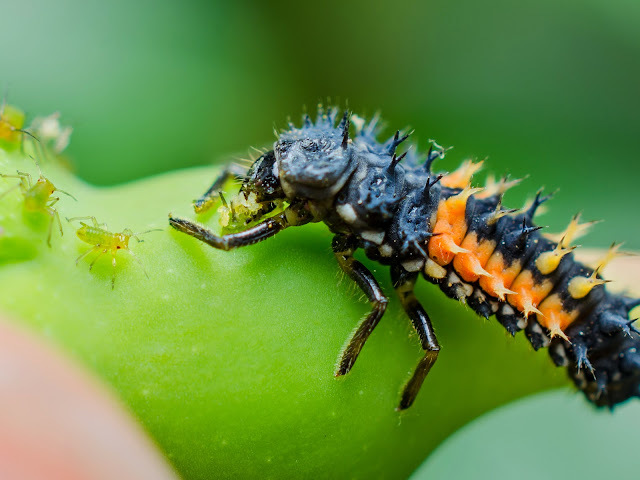 Let us touch upon some of the beneficial insects one may come across as we saunter through a typical pesticide free --or at least minimally pesticide free-- garden. These are the ones you wish to have live in your garden, call "home". 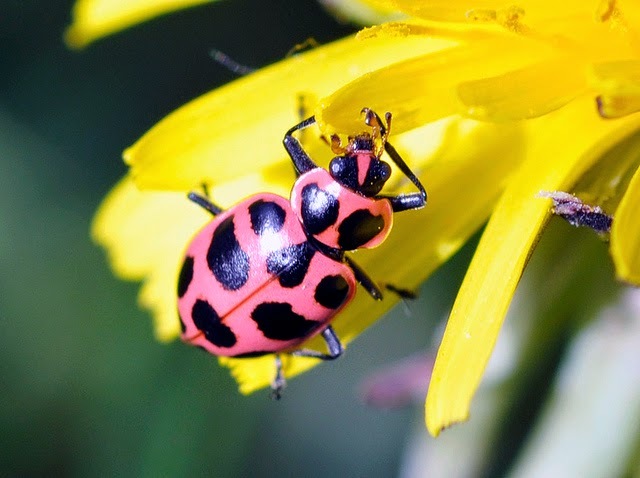 How does one encourage and support beneficial insects in the yard? Practicing I.P.M. helps heal the land and satisfies the soul. 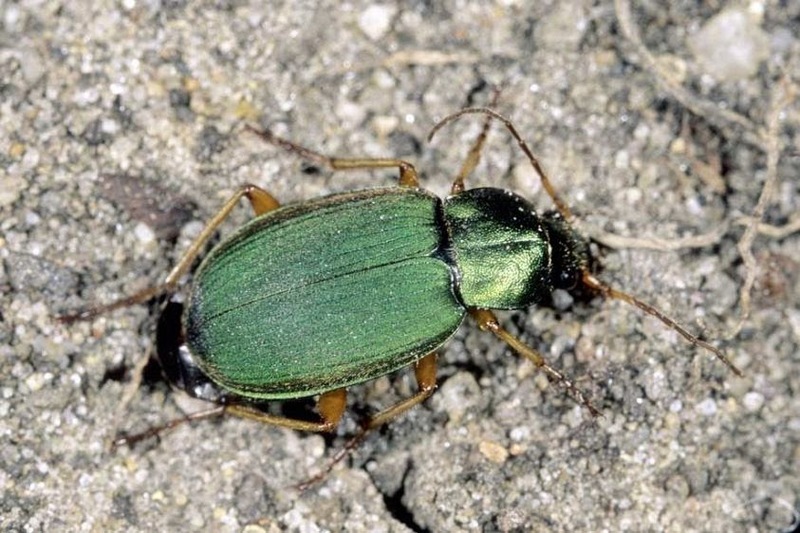 It encourages beneficials to help you control, but not necessarily eliminate insect pests. With I.P.M. you ain't gonna have a pristine garden; get over that concept. You will have undesirable bugs living in it. The key is to keep them in check to acceptable levels via the beneficials. One way to reign in pesky snails is to invite someone from France over to spend a little time visiting and staying at your home. True story: my mother and grandmother both come from France. When I was still in high school, mom invited her mother to visit the U.S. and spend some time with us. Her first morning here, grandmother walked through the garden in the back with coffee mug in hand. Very shortly, she scooted back into the kitchen very excited. "Suzette!" (in French of course) "Did you know you have snails living in the back, and they are the small dark ones! Why do you not eat them?" Apparently, the small dark snails (our common garden snail, Helix aspersa) are considered to be a delicacy on par with the elusive black truffle in France. "I never thought of it." replied mom. "Well, you should eat them!" retorted grandmother! When it comes to gastronomie, the French get very excited. Consequently, mom and grandmother went out to the back with a container in hand and proceeded to pick snails, as one would pick berries in the woods. After preparing them a few days for eating as the French do, mom, dad, grandmother, and myself, feasted on escargot one evening; mom and grandmother extolling the virtues of the small dark snail. But I digress. 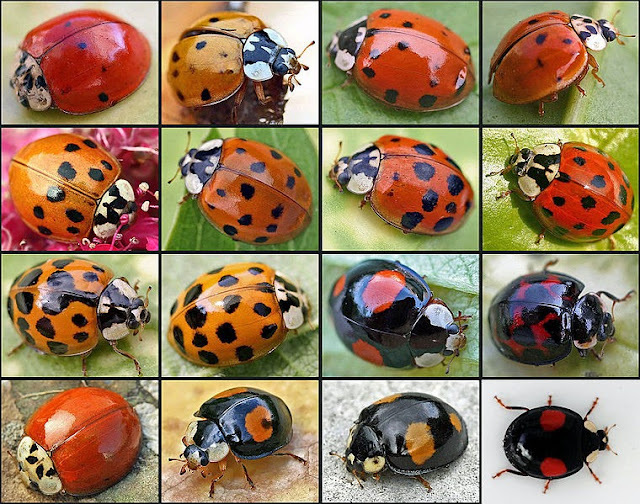 Ladybugs come in several forms and colors, depending upon the species. 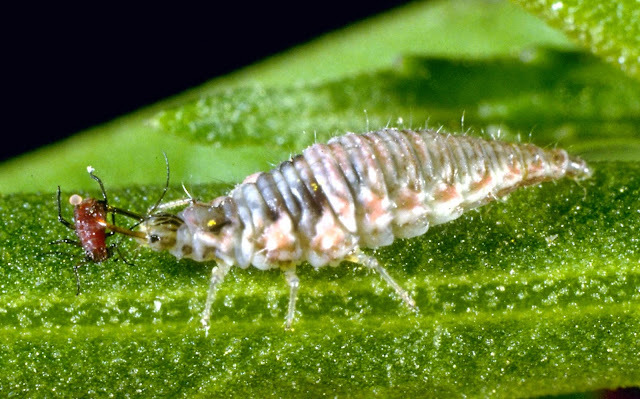 They are known for their voracious appetites consisting of aphids. One of the best pest abatement aides for the gardener, they sure are pretty too. 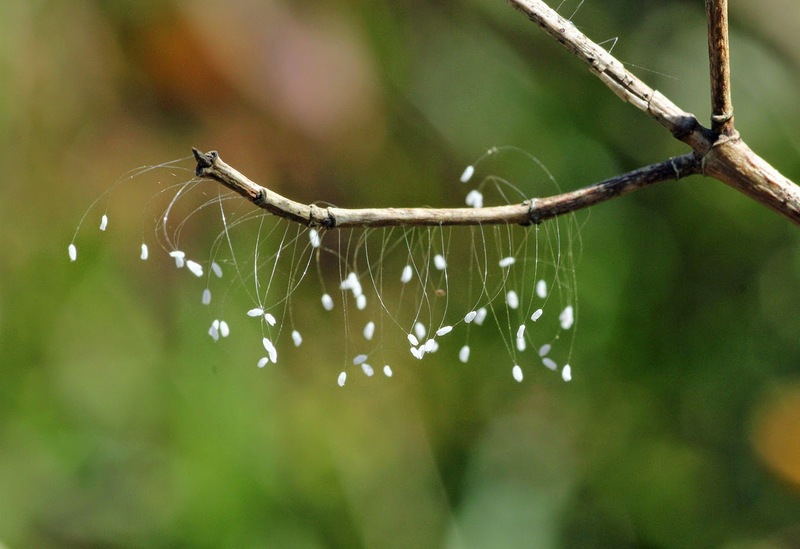 Lacewing adults and larvae are wonderful additions borne in the quiver of a resourceful gardener. 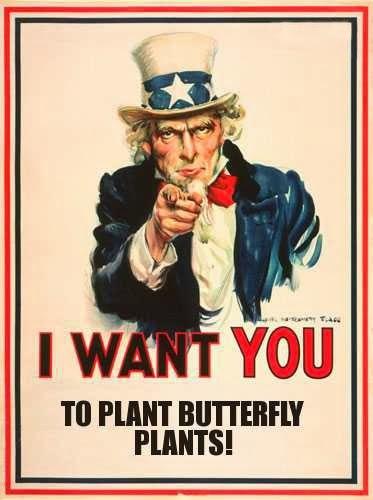 There are quite a few species of lacewing, green being the most prevalent in the Container Butterfly Garden. Lacewings sometimes get into the house, as they are attracted to lights at night. On these occasions I try to capture them, and then safely place my errant little friends outdoors. At a point in time of my gardening experiences, I realized the importance of beneficial insects and their impact on insect pests. Lacewings were known to me, but I began at times noticing these strange filaments hanging on stems and leaves on my plants. At first I thought they were a form of fungus, so I rubbed them off or snipped the offending portion of the plant with the so called fungus attached. To my untrained eye, they looked just like fungal fruiting bodies filled with spores. It wasn't until some time afterwards that I learned these were not fruiting bodies, but the eggs of lacewing insects. If you spot these stalked eggs in your garden, consider yourself blessed! 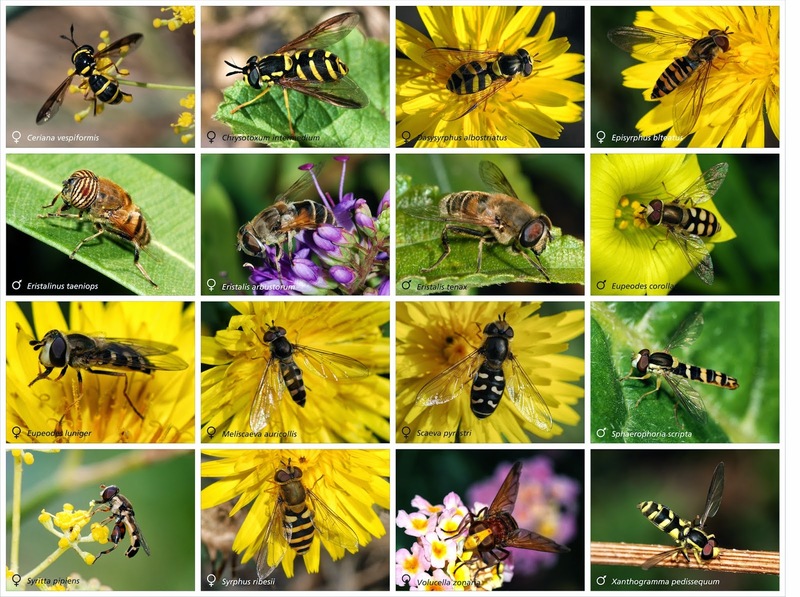 Commonly known as hover flies, Syrphid flies are true flies belonging to the Diptera family of insects, which also include pesky mosquitoes. In Spanish, "mosquito" means "little fly". Syrphid flies are the bulbous-eyed critters that hover around plants and flowers like a hummingbird. A reoccurring theme amongst the various species is their use of mimicry to foil predators from stalking them. Many look like the aggressive hornets; others mimic honeybees. 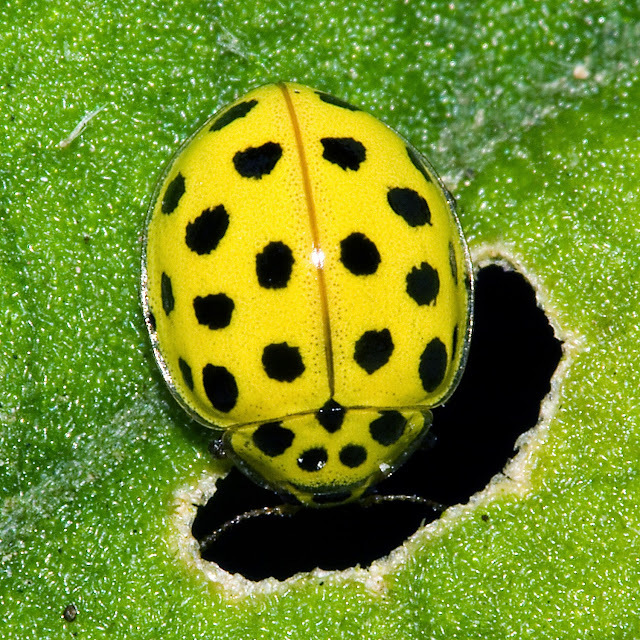 Adults feed on nectar, whereas the larvae feed on different foods; some feasting on decaying vegetative matter, others hunting and eating aphids, thrips, and other plant sucking insects. 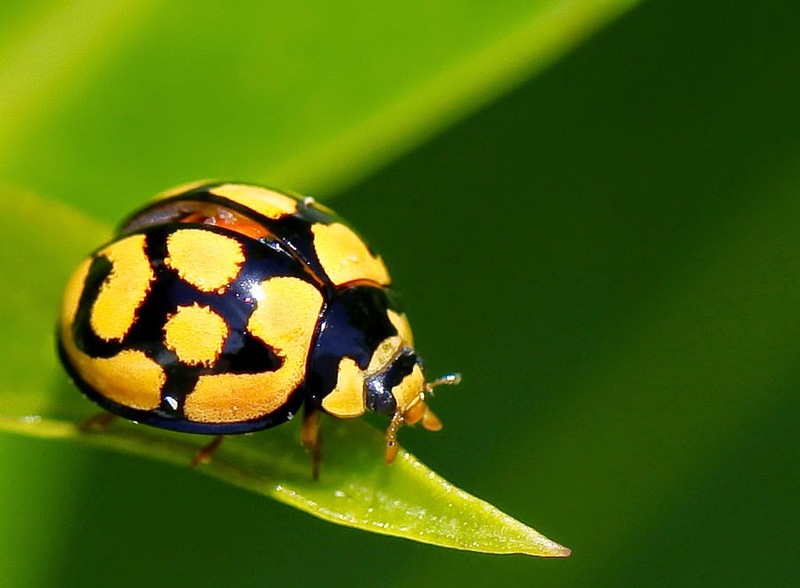 These little creatures are a mixed blessing for butterfly gardens. 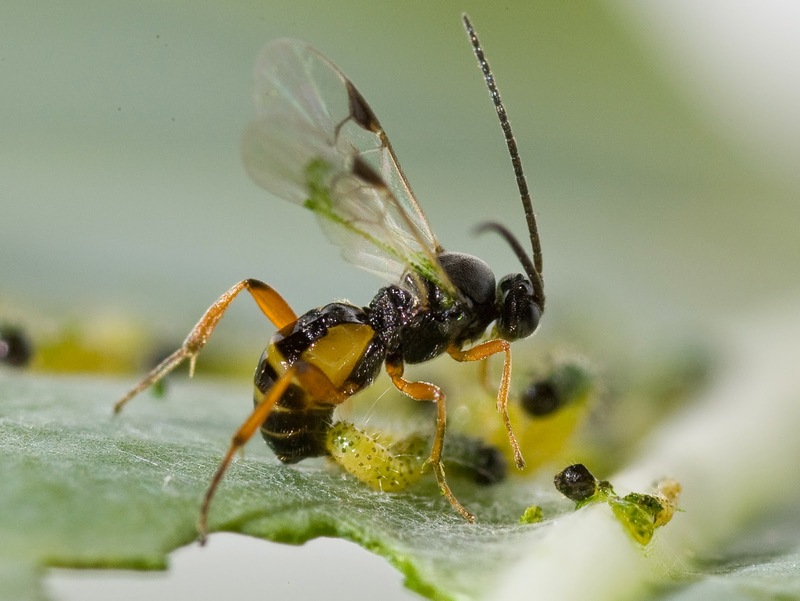 Some species of parasitic wasps inject their eggs into aphids, eventually leaving an empty shell behind upon emerging as an adult. Unfortunately, others parasitize caterpillars. How to tell them apart? 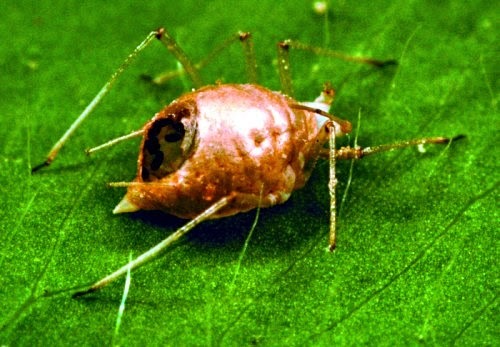 Beats me, but I do know when aphids have been attacked, by the telltale remnants of their exoskeleton. Some of these wasps are so tiny they look like flying specks and are easily overlooked. 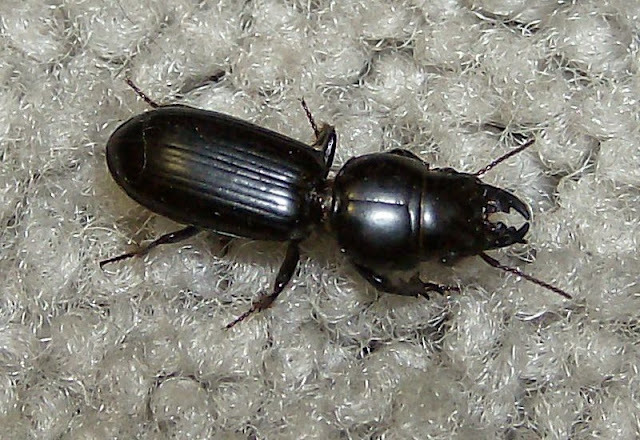 Lastly, but not leastly, we come to the lowly Ground beetles; those denizens at soil level that make us feel uncomfortable and go "Ick!" 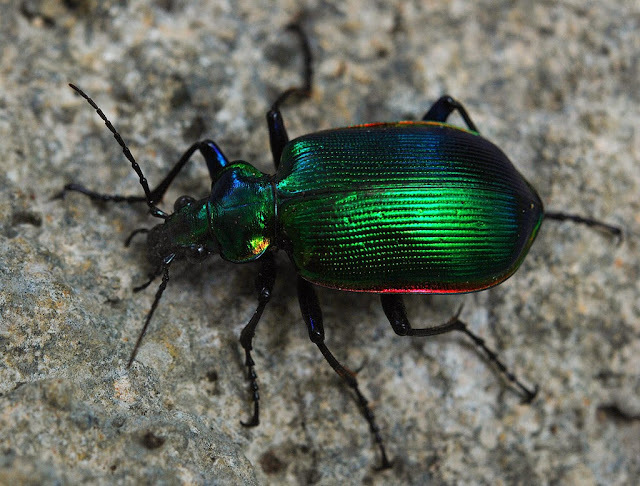 when we see them, but once understood, become trusty allies in our fight to combat garden pests. 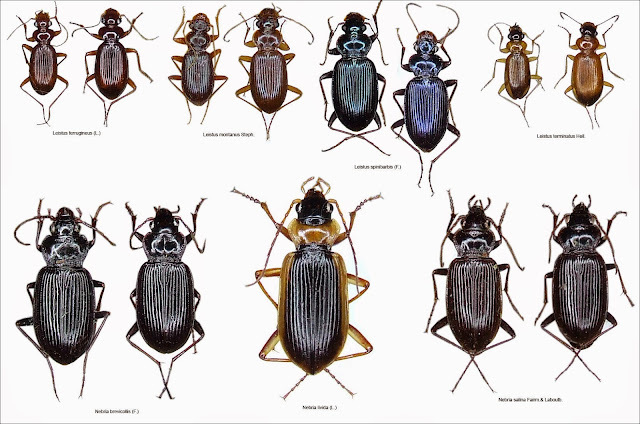 There are a myriad of different ground beetle species. Looking at the various forms and colors, at times it's hard to imagine they are related to each other. Pray tell that this is carpeting and not someone's Bichon Frisé? 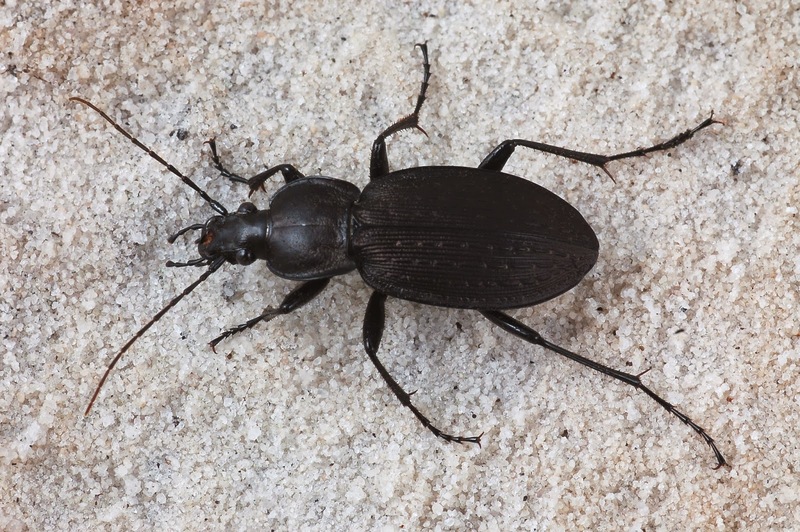 I especially enjoy watching long necked ground beetles (immediately above), as they are very methodical when searching for prey. They walk slowly and determinedly; halt, peer around by actually cocking and pivoting their heads without having to move their bodies, and then stalk some more, repeating this maneuver throughout their quest for prey. Alas, some species of ground beetles hunt caterpillars too, but again as with certain parasitic wasps, it's something the container garden can live with. For anyone interested, Planet Natural offers a bounteous bevy of beneficial bugs to buy. 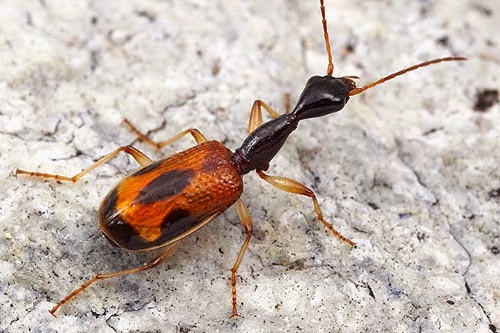 If one stops indiscriminately carpet bombing their yards with harsh chemical pesticides, eventually a manageable balance of both good and not so good insects can be achieved without having to shell out dinars for beneficials. In time, a balanced ecosystem can become a reality in our own gardens. And after all, isn't that what we wish in our hearts, to return to at least a vestige of the Garden of Eden? I know I do! As you can gather by the amount of space and photos devoted to insects in this post, I do have a warm spot in my heart and hold a fascination for them. It probably stems from my days living in Venezuela from birth until almost age 5, when according to my parents, I would crouch on my knees for seemingly endless amounts of time studying and observing bugs of all sorts, and anything else that moved be it bug, bird or beast; on the ground, up in the trees, or flying through the air. One memory that still lingers is watching the endless procession of leaf cutter ants carrying bits of plant matter back to their nest, clasped within their jaws and held above their heads. The thrill is still there when visiting the tropical exhibit at the San Diego Zoo Safari Park, where a colony of leaf cutter ants call home.